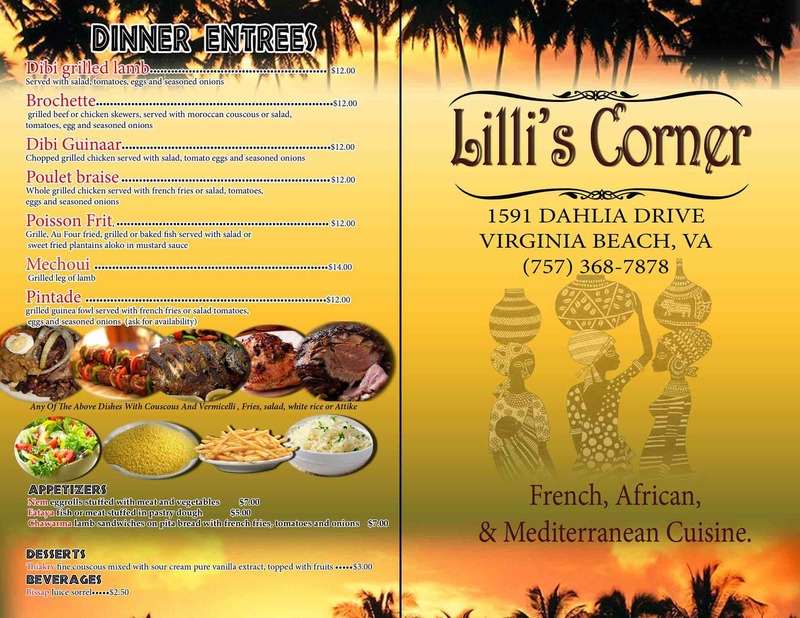 At Lilly’s Corner in Virginia Beach, VA, quality service and outstanding African food is what customers find every day. We have only been open for about one year, but our reputation for good food and care is spreading quickly throughout the area. It isn’t taking people long to see that when it comes to good food, that Lilly’s Corner is what comes to mind. We specialize in authentic African dishes to meet your every desire. Our team will do whatever is necessary to make your dining experience a memorable one. Our desire is to have you as a customer for life. And if your request is for take out service or for a special event where catering is needed—we have you covered with service that just cannot be beat anywhere throughout the Virginia Beach, Va. area. We are the best. As for pricing, whether you are dining in or requesting delivery, at Lilly’s Corner, prices are always affordable. We want your catering event or dining experience to be enjoyable and relaxing. It’s for that reason that we have put together a staff to handle anything you want or desire in African food. There will always be competition around, but with us, we promise unmatched customer service with enjoyable African food in a relaxed atmosphere that you won’t find anywhere else. We count it a privilege to have you dine with us. That’s why we are delighted to serve and treat you to the finest of food from the continent of Africa. The diversity of our cuisines will reflect the preparation of styles and techniques of cooking that will make you glad you made us at Lilly’s Corner your choice. Call on us so you can see that you have come to the right place for all types of African food and cuisines.